KOKONUGGZ creates gourmet chocolate products and is one of the most recognised non-medical confection companies in California. 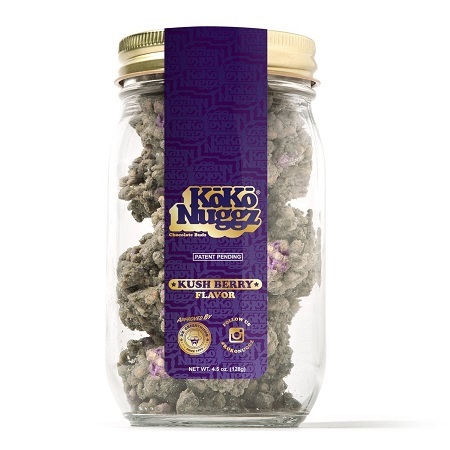 Kush Berry Flavour Chocolate Budz by KokoNuggz: KOKONUGGZ creates gourmet chocolate products and is one of the most recognised non-medical confection companies in California. The finest chocolate begins with the best beans. We acquire our chocolate from a source that selects cocoa beans from around the world for their quality to deliver a premium chocolate experience. The percentage of cacao in the chocolate is derived from the cocoa bean and excludes any other flavours or additives, natural or artificial. Ingredients: Rice, Flour, Dry Nonfat Regular Milk with added Vitamin A and Vitamin D, Ciranda Sunflower Lecithin, Whey Protein Isolate (unflavored), Organic Barley Malt Extract, Sugar, Oil, Industrial Palm Oil & Palm Kernel Filling etc. , Vegetable low Saturated Fat, Riboflavin (Vitamin B12), Salt, Blueberry Flavor, Vitamin B6, Milk. Contains eggs, gluten, and milk. Made in a factory that uses nut ingredients. May contain traces of nuts.